Reverse hyper-pigmentation and restore your youth with a powerful skin care serum. C15 is a potent serum designed to remove dark spots. This serum reduces the effects of sun damage and aging while also brightening, lightening and smoothing your skin. When this special blend of licorice root extract (Glycyrrhiza glabra) and white mulberry root extract (Morus alba) is applied topically, it helps regulate melanin synthesis, therefore brightening skin complexion to reduce dark spots and blemishes where melanin has accumulated in high concentrations. This special blend is further combined with vitamin C (ascorbic acid), one of the most powerful antioxidants available. Vitamin C works by soaking up free radicals that your skin absorbs from exposure to ultraviolet radiation and environmental pollutants. 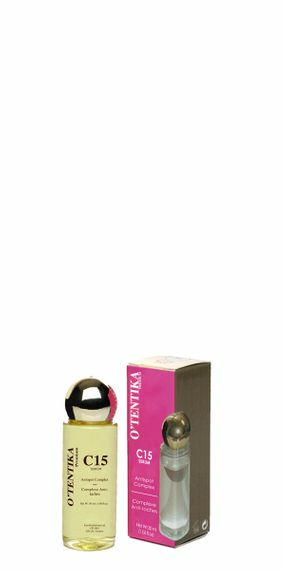 Like all similar beauty products, O'tentika® C15 Serum is intended for external use only. Should not be mixed with other products. Avoid contact with the eyes, and if irritation develops, discontinue use. Do not use on children under the age of 12. Finally, watch out for laugh lines as you find your skin's healthy glow causes you to smile and laugh more frequently.